The WET Deck is open to AWAY Spa guests before and after their treatments, 9am-9pm. Pool access is available 7 days a week now through Spring. 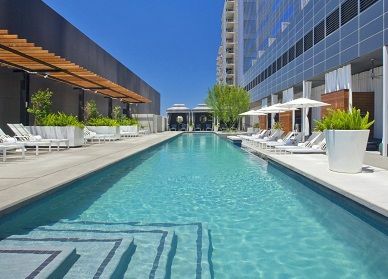 From sunrise to sunset, W Austin's WET® pool deck is open for your dipping pleasure! The WET deck features private cabanas, lounge chairs, a fireplace and two outdoor showers to rinse off after a quick dip. Snacks and drinks are available for purchase at the WET Bar. Enjoy the poolside scene in optimal luxury by reserving a private Cabana or Kasbah during your stay. *Subject to availability. Some restrictions and black-out dates apply. Children under the age of 16 not allowed unless accompanied by parent or guardian. No outside food or beverage allowed. Closures due to inclement weather may occur.